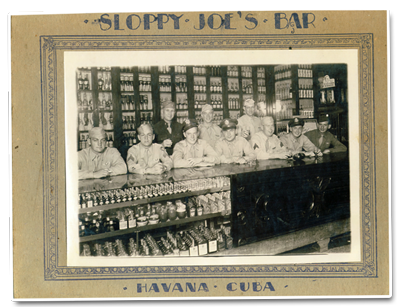 The official beginning of Sloppy Joe’s Bar, the famous and infamous Key West saloon, was December 5, 1933–the day Prohibition was repealed. The bar was destined to go through two name changes and a sudden change of location before it would become Sloppy Joe’s, seen by millions of visitors to Florida’s southernmost outpost. 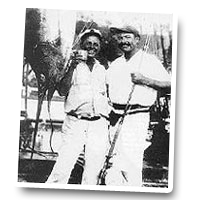 Key West being a bastion of free thinkers even in the thirties, Prohibition was looked on as an amusing exercise dreamed up by the government–and Joe Russell was just one of the enterprising individuals who operated illegal speakeasies. Even Ernest Hemingway, who made Key West his home at the time, slipped over to Russell’s on occasion to buy illicit bottles of Scotch, and the two struck up an enduring friendship. When the government’s Great Experiment ended a dismal failure, Joe Russell became a legitimate saloon-keeper-proprietor of the Blind Pig, a droll rundown building that Russell leased for three dollars a week. The rowdy, come-as-you-are saloon was renamed the Silver Slipper upon the addition of a dance floor, but that didn’t matter–it remained a place of shabby discomfort, good friends, gambling, fifteen-cent whiskey, and ten-cent shots of gin. It was Hemingway, a favorite patron of Russell’s bar from the start, who encouraged its name change to Sloppy Joe’s. The new name was adopted from Jose Garcia Rio Havana club selling liquor and iced seafood. Because the floor was always wet with melted ice, his patrons taunted this Spanish Joe with running a sloppy place… and the name stuck. 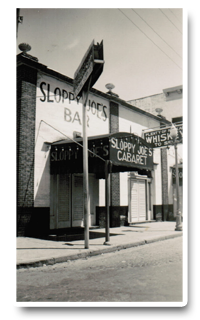 In its early days in Key West, Sloppy Joe’s boasted several trademark “fixtures” besides Hemingway. There was “Big” Skinner, the hearty black bartender who tipped the scales at 300 pounds and served Sloppy’s customers for more than two decades. Sloppy Joe’s migrated across the street to its present location on May 5, 1937. The move was occasioned by a rent increase that Joe Russell refused to pay: from three dollars a week to a whopping four. Luckily, the former Victoria Restaurant owned by Spanish emigrant Juan Farto was vacant. Located at the corner of Duval and Greene streets, the Victoria had been built in 1917 and incorporated beautiful Cuban tile work, busily whirring ceiling fans, and jalousie doors. Joe Russell paid $2,500 for it. In true Key West fashion, the bar never actually closed during the transition–customers simply picked up their drinks and carried them, along with every piece of furniture in the place, down the block to 201 Duval Street. Service resumed with barely a blink. The new Sloppy Joe’s boasted the longest bar in town. Behind the bar, in the back room, were gambling and pool tables. Inside the bar hung life-size paintings of fighters on the walls, and adorning one wall was a 119-pound sailfish caught by Hemingway. Skinner had a place of pride above his new long curved bar. The bat Skinner used to control his patrons still hangs on the wall today. Joe Russell was a charter boat captain, rumrunner, Hemingway’s boat pilot, and the author’s fishing companion for twelve years. In his company, Papa once caught an astonishing 54 marlin in 115 days. Hemingway called him “Josie Grunts” and used him as the model for Freddy, the owner of Freddy’s Bar and captain of the Queen Conch in To Have and Have Not. Joe Russell died in 1941 of a heart attack. He was 53 years old. When Joe officially opened the bar, Hemingway and his “Mob” of cohorts were enthusiastic regular customers. In fact, the author once called himself a co-owner or silent partner in the enterprise. The “Mob” was comprised of some of the literary lights of the day as well as a variety of famous and infamous local residents: John Dos Pasos, Waldo Pierce, J.B. Sullivan, Hamilton Adams, Captain Eddie Saunders, Henry Strater. They wrangled, drank, and philosophized the days away, never knowing they were building a legend. When Hemingway left Key West in 1939, he left a number of personal effects stored in a house next to Sloppy Joe’s. After the house was sold, the effects were moved into the back room behind the bar at Sloppy’s. They remained there until 1962, a year after Hemingway’s death, when his widow opened the room and took possession of them. Some of the memorabilia was given to the then-owner of the bar to be displayed. Over the years Sloppy Joe’s, like rare Cuban rum, has gained a richness and flavor while essentially remaining unchanged. The ceiling fans still whisper busily, a little bit wobbly but carrying on. The jalousie doors open on a Duval Street busier than even Hemingway could imagine, yet still bearing the offbeat ambience that prompted him to brand Key West “the St. Tropez of the poor.” The long curving bar wears the scars of generations of visitors and Hemingway aficionados, drawn by the legend and hoping some measure of magic will rub off on them–and it does. Open 365 days a year, from 9:00am-4:00am daily (noon-4:00am on Sundays). Sloppy Joe’s has three complementary divisions: food, beverage, and retail store. The bar offers generous drinks, live music and dancing. The quality of the entertainment, showcased on the huge stage facing Duval Street, is exceptional–and ranges from rollicking bluegrass to raucous rock. Just as in Joe Russell’s day, hospitable bartenders welcome patrons at virtually all hours of the day or night. The satisfying large drinks and casual, undemanding atmosphere so successful in Russell’s reign remain–as does the sense, strong as a pulsebeat, that something unusual is always about to happen at Sloppy Joe’s. The menu includes American Caribbean with bar favorites such as burgers, sandwiches and salads. Its offerings are consistently top-quality, consistently satisfying, and just like Key West there are occasional changes, but the tradition of good food always remains. Sloppy Joe’s Retail Store offers a variety of t-shirts, tank tops, sweats, hats, glassware, souvenirs and more. Our merchandise features the internationally recognized Sloppy Joe’s logo. As in the thirties, Sloppy Joe’s is still a Key West landmark that has become internationally famous and attracts hundreds of thousands of visitors annually. A major player in the Duval Street scene, the bar continues to support the Hemingway heritage by hosting the outrageous annual Hemingway Look-Alike Contest. 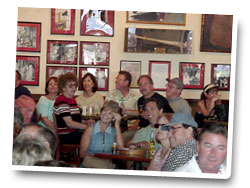 The renowned Hemingway Days Festival itself began at Sloppy Joe’s in 1981, ultimately becoming a weeklong celebration honoring Hemingway as both writer and sportsman. Today it incorporates events including an internationally recognized short story competition, street fair, and storytelling contest. In mid-July each year, Sloppy Joe’s is thronged with cheerful bearded men competing for the title of Hemingway Look-Alike, while Hemingway family members judge their worthiness and hundreds of spectators cheer on their favorites. The Look-Alikes have gained such a measure of fame that they have even been featured on Good Morning America. The Look-Alike Society, composed of each year’s contest winners, is now organized as a nonprofit group with educational and environmental concerns. Sloppy Joe’s … A Key West Tradition!